Well that kind of gives the game away, doesn’t it? John Joseph Adams, uncontested king of the sci-fi anthology and curator or the wonderful Wastelands, is back with a rather unique take on apocalyptica. In partnership with Hugh Howey, bestselling author of the Wool series, he has once more brought together some of the brightest names in the genre to give us the Apocalypse Triptych. Rather the the typical focus on the aftermath of whichever disaster happens to befall humanity he instead holds a magnifying glass to three distinct phases, gathered in three chronological volumes. 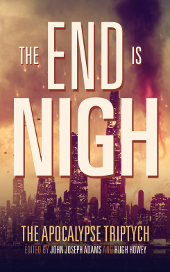 The End Is Nigh is probably the first ever collection of pre-apocalyptic fiction. It’s the beginning of the end, the spark which gives rise to the ultimate inferno. It’s also, perhaps surprisingly, the most disturbing period of Armageddon. Everything seems so normal, life going on as if nothing were amiss. But someone, somewhere, always knows, always has the inside track. Whether an agent of mankind’s demise or simply an unfortunate observer in the wrong place at a horrific time, these are the people who tell us their tales. As might be expected, The End Is Nigh pulls together an impressive variety of apocalypses. Everyone’s used to the holy trinity of aliens, nukes and plagues (including zombies in that last category). This book covers all of the above and then some. The alien invasion tale The Fifth Day Of Deer Camp provides us with a wonderful cliffhanger as a group of ageing, beer-soaked hunting buddies stumble across a UFO beside their backwoods cabin. According to the radio, similar craft have begun laying waste to the rest of civilisation. It’s a classic “what would you do?” situation, leaving you standing shivering outside the hunting lodge, miles from anywhere, shotgun in hand and alien ship duly glowing. There’s room in here for a couple of more realistic – even inevitable – cosmic catastrophes. Heaven Is A Place On Planet X takes us down the religious cult road, a group of eschatologically-fixated evangelists holding out in their commune and awaiting the end of days in their compound – the end heralded by the wandering Planet X. A familiar story from the newspapers, except this bunch happen to be right. In The Balm And The Wound another collision is imminent, this time with the moon. This most poignant of tales has the moonbase astronauts discover their fate, only to realise that precious few of them can make the escape to earth – and that even those who do return will still face almost certain death and unimaginable hardship. Despite opening the volume, this story stuck with me as the most moving by virtue of its relative realism and imposing yet almost banal bleakness. And moving away from the Michael Bay mixture of explosions and carnage we have yet more vignettes featuring more subtle scenarios, no less deadly for their relative restraint. System Reset takes a new spin on the nuclear threat as a hacker underground determines to return mankind to the stone age by launching its nuclear arsenal yet having them explode safely far above the Earth’s surface. The resulting EMP bursts will fry any electronic equipment, except for the hackers’ own safe zone. Although that zone may not be as safe as they had anticipated. An the award for most outright eerie tale goes to Spores. Despite taking an anti-GMO line which earns it big minus points in my book it still manages to win favour through its superbly creepy and unstoppable fungal growth, one which still makes my skin crawl to recall it. The rest of the tales live up to the same high standards of entertainment and originality as those already mentioned but that’s not all The End Is Nigh has to offer. This is just part one, remember? First installment of the Apocalypse Triptych. So not only are there two further volumes to anticipate with joy but Adams and Howey managed to convince most of the authors to participate for the duration. So what we really have here is the Epic Book Of Catastrophic Cliffhangers. It’s just as evil as it sounds. So please do follow up my recommendation to grab and savour a copy of this book, but be wary of your patience levels. I’m already counting the days to Vol. 2 with Song-Of-Ice-And-Fire-esque desperation.